Hennepin County is included in the Minneapolis-St. Paul-Bloomington, MN-WI Metropolitan Statistical Area. 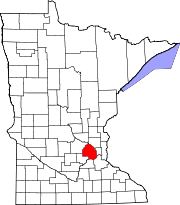 Hennepin County was created in 1852 by the Minnesota Territorial Legislature. Father Louis Hennepin's name was chosen because he originally named St. Anthony Falls and recorded some of the earliest accounts of the area for the Western world. Hennepin County's early history is closely linked to the establishment of the cities of Minneapolis and St. Anthony. The history of Hennepin County is cataloged at the Hennepin History Museum, located in Minneapolis. According to the U.S. Census Bureau, the county has a total area of 607 square miles (1,570 km2), of which 554 square miles (1,430 km2) is land and 53 square miles (140 km2) (8.7%) is water. Hennepin is one of 17 Minnesota counties with more savanna soils than either prairie or forest soils, and is one of only two Minnesota counties with more than 75% of its area in savanna soils (the other is Wright County). The highest waterfall on the Mississippi River, the Saint Anthony Falls (discovered by Louis Hennepin) is in Hennepin County next to downtown Minneapolis, but in the 19th century, the falls were converted to a series of dams. Barges and boats now pass through locks to move between the parts of the river above and below the dams. According to the 2010–2015 American Community Survey, the largest ancestry groups were German (26.3%), Norwegian (12.6%), Irish (10.8%), and Swedish (8.3%). At the 2000 Census, there were 1,116,200 people, 456,129 households, and 267,291 families residing in the county. The population density was 774/km² (2,005/mi²). There were 468,824 housing units at an average density of 325/km² (842/mi²). The racial makeup of the county was 80.53% White, 8.95% Black or African American, 1.00% Native American, 4.80% Asian, 0.05% Pacific Islander, 2.06% from other races, and 2.60% from two or more races. 4.07% of the population were Hispanic or Latino of any race. There were 456,129 households out of which 28.80% had children under the age of 18 living with them, 45.30% were married couples living together, 9.90% had a female householder with no husband present, and 41.40% were non-families. 31.80% of all households were made up of individuals and 8.40% had someone living alone who was 65 years of age or older. The average household size was 2.39 and the average family size was 3.07. In the county 24.00% of the population was under the age of 18, 9.70% was between 18 and 24, 33.70% from 25 to 44, 21.70% from 45 to 64, and 11.00% were 65 years of age or older. The median age was 35 years. For every 100 females there were 97.00 males. For every 100 females age 18 and over, there were 94.70 males. The median income for a household in the county was $51,711, and the median income for a family was $65,985 (these figures had risen to $60,115 and $79,970 respectively as of a 2007 estimate) Accounting for inflation, these figures rise again to $76,202.87 for individuals, and $92,353.46 for households, adjusted for 2014 dollars. Males had a median income of $42,466 versus $32,400 for females. The per capita income for the county was $28,789. About 5.00% of families and 8.30% of the population were below the poverty line, including 10.50% of those under age 18 and 5.90% of those age 65 or over. Hennepin County is the wealthiest county in Minnesota and one of the 100 highest-income counties in the United States. Besides English, languages with significant numbers of speakers in Hennepin County include Arabic, Hmong, Khmer, Lao, Russian, Somali, Spanish, and Vietnamese. Like all counties in Minnesota, Hennepin is governed by an elected and nonpartisan board of commissioners. In Minnesota, county commissions usually have five members, but Hennepin, Ramsey, Dakota, Anoka and St Louis counties have seven members. Each commissioner represents a district of approximately equal population. In Hennepin the county commission appoints the medical examiner, county auditor-treasurer and county recorder. The sheriff and county attorney are also elected on a nonpartisan ticket. The county government's headquarters are in downtown Minneapolis in the Hennepin County Government Center. The county oversees the Hennepin County Library system (which merged with the Minneapolis Public Library system in 2008), and Hennepin County Medical Center. Hennepin County's normal operations are coordinated by the County Administrator David Hough, Deputy County Administrator for Health and Human Services Jennifer DeCubellis, Assistant County Administrator for Operations Chester Cooper, Acting Assistant County Administrator for Public Works Chris Sagsveen, and Assistant County Administrator for Public Safety Mark Thompson. Under Administrator Hough's leadership, the number senior management positions in the county has grown by 40%. Minneapolis–Saint Paul International Airport (MSP) serves the Twin Cities area. It is the 17th-busiest airport in the United States by passenger traffic and serves as a hub for Delta Air Lines. Crystal Airport (MIC) is a public airport in Crystal. Flying Cloud Airport (FCM) is a public airport in Eden Prairie. As the economic center of Minnesota and the Upper Midwest, Hennepin County is home to many major companies in a diverse section of industries. As of the 2018 estimate, there are twelve Fortune 500 companies headquartered in Hennepin County, five of which are located in Minneapolis. Hennepin County is also home to several major private companies such as Carlson and Cargill, both located in Minnetonka, the latter of which is the largest privately-owned company in the United States. Along with these major companies, Hennepin County also contains several large employers, as listed below. According to the 2016 American Community Survey, the largest overall industries in Hennepin County are healthcare and social assistance (96,511 workers), manufacturing (80,324), and retail trade (75,861). According to the 2016 American Community Survey, the average household income in Hennepin County is $71,200. The GINI Index for 2016 was 0.461, lower than the national average of 0.485. As of 2016, nearly 132,000 residents of Hennepin County were living under the poverty line, a full 10.9% of the county. This figure is lower than the national average of 14%. Minnehaha Falls is the main attraction and namesake of Minnehaha Park. Hennepin County, and in particular the city of Minneapolis, is renowned for its expansive and high-quality park system. The Minneapolis park system has been called[by whom?] the best-designed, best-financed, and best-maintained in America. The Minneapolis park system has been named the top park system in the country by the Trust for Public Land for 5 consecutive years as of 2017. Many of the Minneapolis' numerous parks are linked by the Grand Rounds National Scenic Byway, a series of interconnected parks and paths in the city that extends for 51 miles. The byway is divided into seven districts: Downtown Riverfront, Mississippi River, Minnehaha, Chain of Lakes, Theodore Wirth, Victory Memorial, and Northeast. The byway includes many major destinations in Minneapolis, including Nicollet Island, St. Anthony Falls, Stone Arch Bridge, Mill Ruins Park, Mississippi National River and Recreation Area, Minnehaha Creek, Minnehaha Park, Lake Hiawatha, Lake Nokomis, Lake Harriet, Bde Maka Ska, Lake of the Isles, Cedar Lake, and Theodore Wirth Park. Outside of Minneapolis, Hennepin County is part of the Three Rivers Park District, a park system containing 20 parks and 10 trails spanning the Twin Cities metro area. Numerous art institutions in Minneapolis make Hennepin County a national center for the arts. It contains some of the largest and most well-known centers for art in the country, including the Minneapolis Institute of Art, Walker Art Center, Weisman Art Museum, and the Minneapolis Sculpture Garden. Major art centers include Northeast Minneapolis and the Minneapolis neighborhood of North Loop. Minneapolis is home to many important artist organizations such as the Traffic Zone Center for Visual Art, the Handicraft Guild, and the Northeast Minneapolis Arts Association. Hennepin County is also home to a thriving theater scene, highlighted by the Guthrie Theater, located in downtown Minneapolis. It is home to many theater companies such as Mixed Blood, Skewed Visions, Brave New Workshop, and Children's Theatre Company. Other notable theaters include the Orpheum Theatre, the State Theatre, and the Pantages Theatre. Additionally, many other cities in Hennepin County are home to local community theaters, such as Eden Prairie, Minnetonka, Orono, Osseo, and Plymouth. U.S. Bank Stadium, home of the Minnesota Vikings, was constructed in 2016, and was the site of Super Bowl LII. Of the "Big Four" sports leagues in the US, three are located in Minneapolis: the Minnesota Twins play in Target Field, the Minnesota Timberwolves play in Target Center, and the Minnesota Vikings play in U.S. Bank Stadium. Additionally, among major sports leagues, the Minnesota Lynx also play in Target Center, and Minnesota United FC currently plays in TCF Bank Stadium, home of the University of Minnesota Golden Gophers, although they will be moving to Allianz Field in Saint Paul for the 2019 season. ^ a b "State & County QuickFacts". United States Census Bureau. Archived from the original on July 11, 2011. Retrieved September 1, 2013. ^ JoEllen Haugo and Mary Jo Laakso (2001). "History of Minneapolis". Minneapolis Public Library. Archived from the original on August 15, 2007. Retrieved September 7, 2007. ^ "2010 Census Gazetteer Files". United States Census Bureau. August 22, 2012. Archived from the original on October 6, 2014. Retrieved October 15, 2014. ^ "U.S. Decennial Census". United States Census Bureau. Archived from the original on May 12, 2015. Retrieved October 15, 2014. ^ "Welcome Languages Archived July 8, 2010, at the Wayback Machine." Hennepin County Public Library. Retrieved on July 8, 2010. ^ "Marion Greene, District 3". Hennepin.us. Retrieved March 7, 2019. ^ The leading "other" candidate, Progressive Theodore Roosevelt, received 11,489 votes, while Socialist candidate Eugene Debs received 5,820 votes, Prohibition candidate Eugene Chafin received 668 votes, and Socialist Labor candidate Arthur Reimer received 619 votes. ^ "Fortune 500 Companies 2018: Who Made the List". Fortune. Retrieved November 15, 2018. ^ "America's Largest Private Companies". Forbes. Retrieved November 15, 2018. ^ a b c "Hennepin County, MN". Data USA. Retrieved November 26, 2018. ^ Team, XPAND Corporation: America's Career InfoNet Development. "America's Career InfoNet: Largest Employers". www.careerinfonet.org. Retrieved November 26, 2018. ^ Cameron, Mark (December 1996). "Reviews : The American City: What Works, What Doesn't Alexander Garvin McGraw-Hill. New York, New York 1995. 475 pages. $59.95". Journal of Planning Education and Research. 16 (2): 148–149. doi:10.1177/0739456x9601600210. ISSN 0739-456X. ^ "Minneapolis parks garner top honor five years running". Southwest Journal. May 26, 2017. Retrieved December 10, 2018. ^ "Grand Rounds Scenic Byway System". www.minneapolisparks.org. Retrieved December 10, 2018. ^ "Sports Teams : Explore Minnesota". www.exploreminnesota.com. Retrieved December 10, 2018.